Sitting in my farm office, the dull light of my oil lamp is reflected in a glass of white wine and I am memorizing my trip to the Samburu tribe I came from yesterday. Its another dark rainy evening without electricity which makes everything seem even more nostalgic. Sipping wine and looking at the sniff tobacco which I got as a gift from my friend James Lenyacopiro. 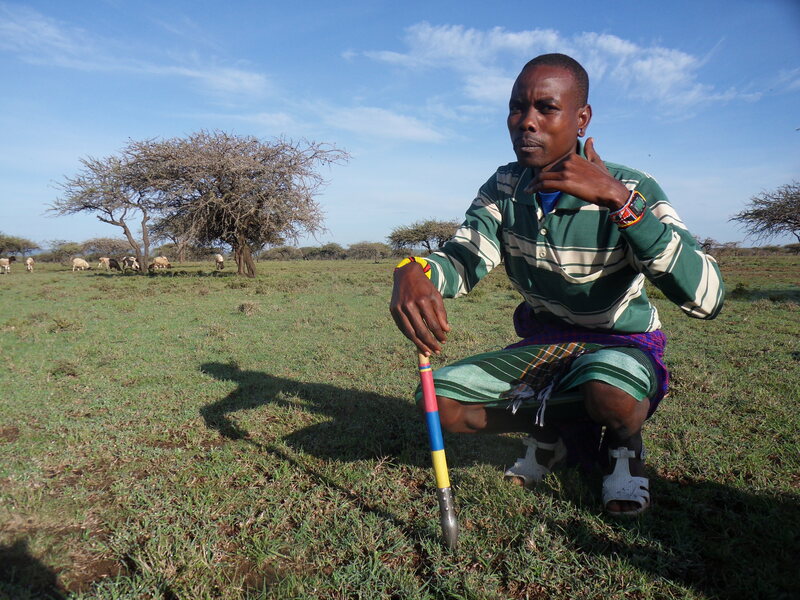 James is my only employee at the farm and last week we went to visit his village in Samburu region. 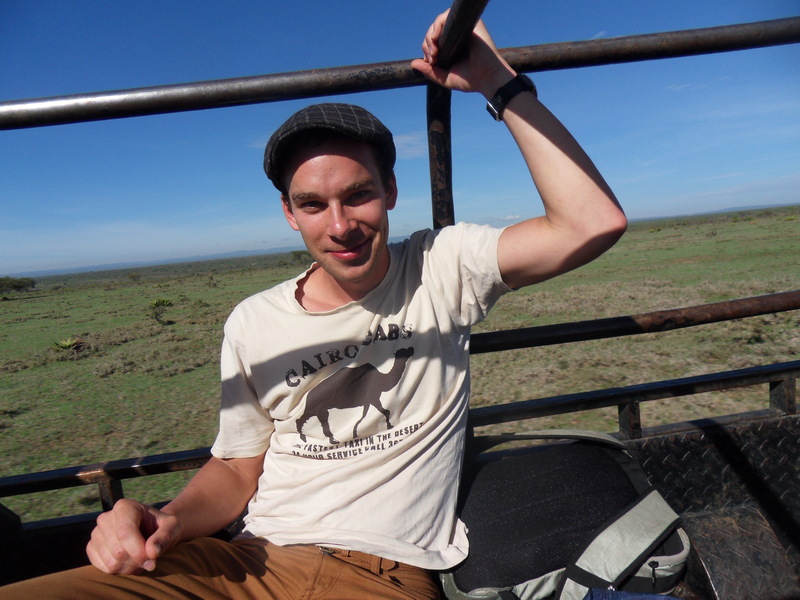 Early in the morning we left the farm together with his cousin John to the main bus station in downtown Nairobi. Our first stop was in the small town Nyahururu close to the Rift Valley where mostly Kikuyu tribe lives. We changed to another bus and hit the raff road full of pot holes to Rumuruti town. 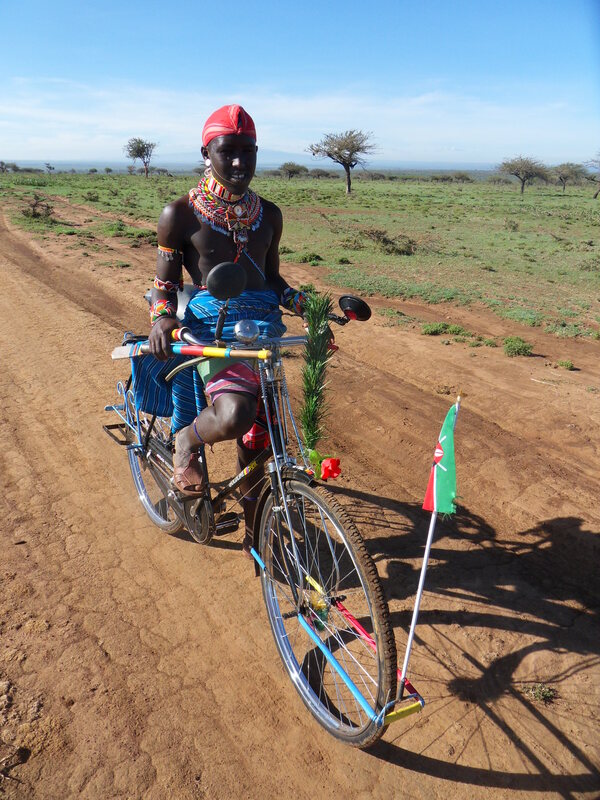 You can already notice that Rumuruti is placed on the edge of both Kikuyu and Samburu tribes. The town is full of life, most of the shops are owned by Kikuyus, business minded people and all around groups of young Samburus are standing with their ‘must have’ walking stick. 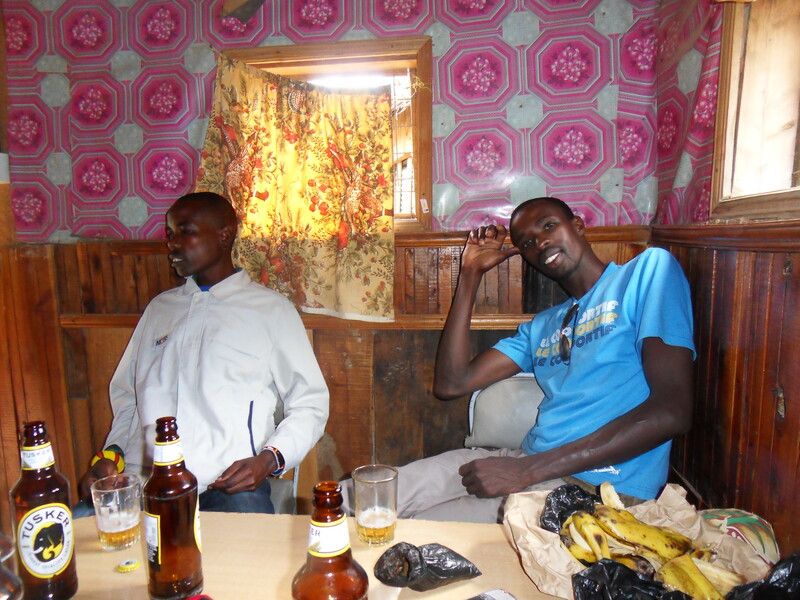 After a short break in Rumurutis local bar and few bottles of local beer Tuscer, we left for the last journey to James’s village. 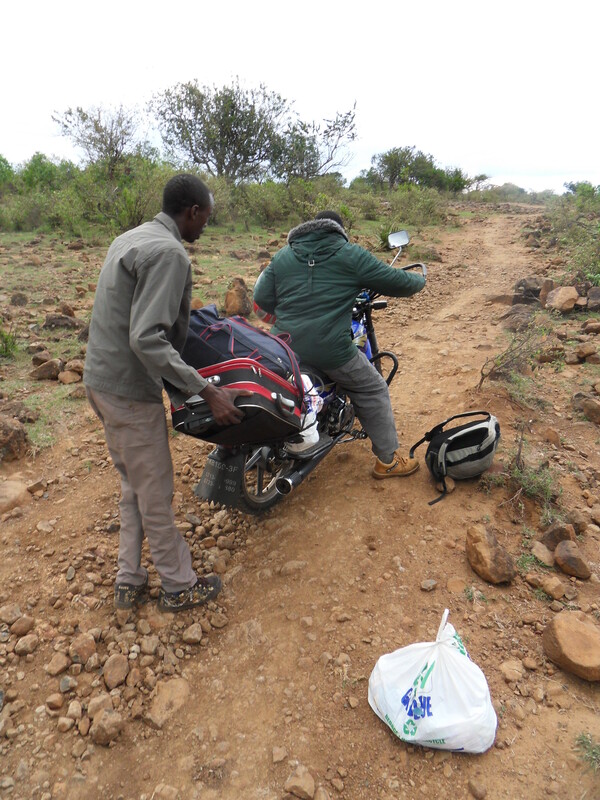 It is not accessible by bus anymore, so we had to take boda boda – motorbikes. The path was narrow, loads of stones and prickly bushes and we had a little accident. Our luggage fell off the bike and rolled all over the place. We managed to put it back and tie it up on the bike and in a short time we got in to the village. The village was small, just a few huts built in a circle with one round fence in the middle for sheep and goats. The houses ( manyattas ) are built of cow dung, mud and sticks. James introduced me to his family. From each hut a few kids came out, and James’s grandmother, mother and other relatives. 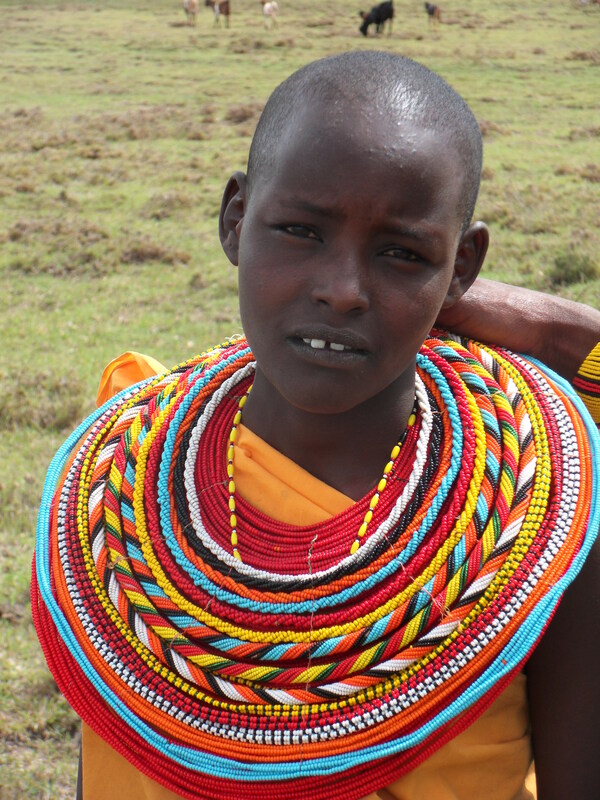 They all speak Samburu language and only few speak Swahili. 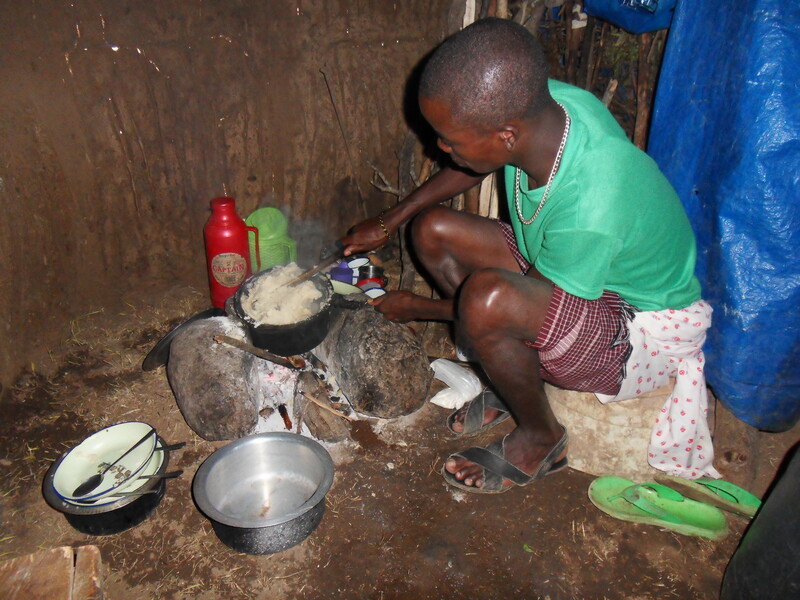 The only person in entire village who spoke English was James’s wife Maria. Most of them have never gone to school, so its hard for them to learn any other language. James took me around their village, showed me where they grow maze and beans and we bumped into his uncle milking a camel. Camel milk is slightly salty but delicious milk. Unlike cow milk, it can be drunk without pasteurisation. 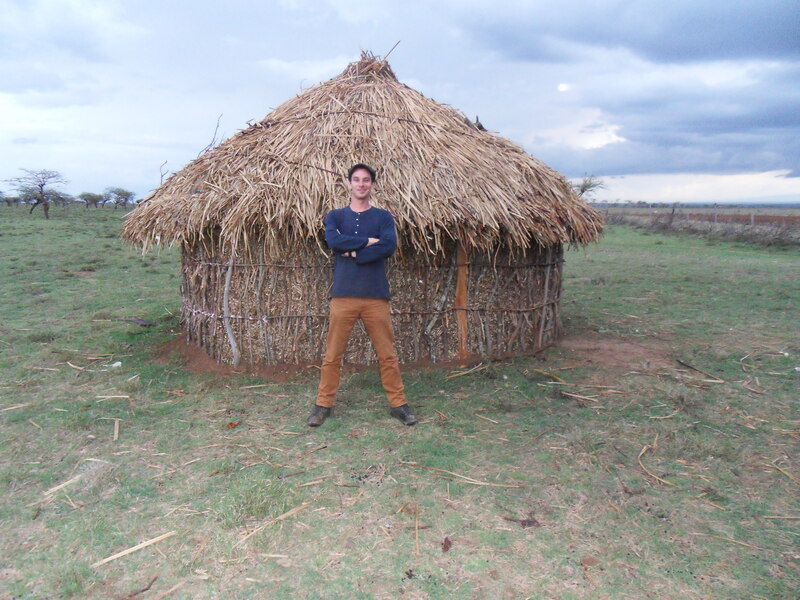 After a nice introduction to the village, we sat in the manyatta together with James, his wife and their son Sabato. I was hungry, but didn’t want to ask for anything and waited for them to start to cook. When it was almost 8pm I asked Maria if they are going to cook dinner. She looked at me with a surprised face and without saying anything she started cooking. She finished her cooking and passed me a plate with ugali and spinach. Ugali is corn flour boiled in water. I asked James why is it only me and no one else eating and he said that he is not allowed to eat in front of his wife and has to cook for himself. 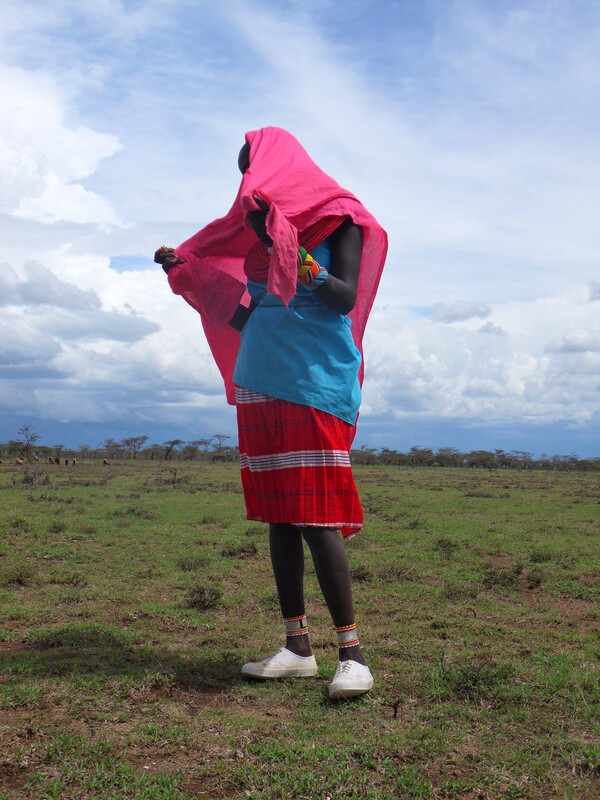 As they did not marry in a traditional way as Samburu do, their marriage is not valid in their tribe. When Maria left the hut, James started to cook. Maria told me in the evening that i will share their bed with them all and i had to come up with an excuse that our tradition does not allow me to sleep on one bed with a woman, so i could sleep only with James and his cousins and we could talk until late evening. I have become good friend with James over the past three years and we share our own humour which would not be understood if Maria was around. James doesn’t speak English and I speak Swahili very little, but we can talk for hours using our face expressions, hands and a mixture of English, Samburu and Swahili. 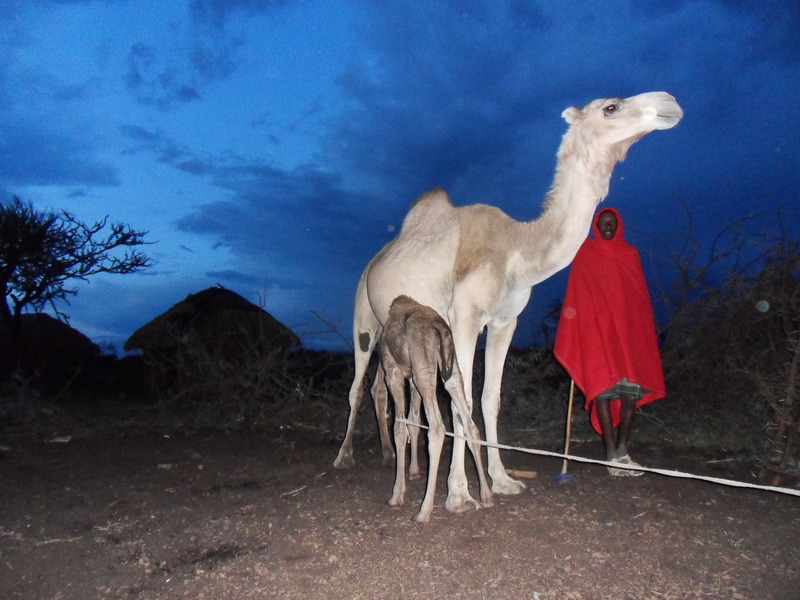 Maria accepted my request, smiled and left the hut to sleep with her baby boy Sabato in her mother’s hut. I gave James a promise that i will only stay for few nights, but he shook his head and said that he will be happy if i stay and that we will have loads of fun together. The thought of muzungu ( white man ) sleeping in his hut was an experience and honour which would be talked of for a long time in the village. After breakfast which consisted of black tea cooked in milk and loads of sugar, used by Samburu as a main intake of energy, we took off for a walk. 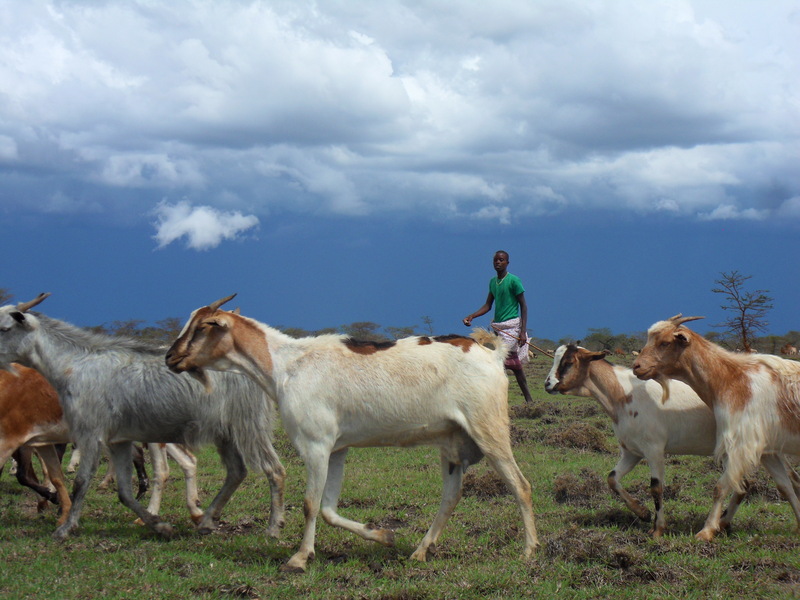 All around are little pathways walked by herds of goats and sheep. The only trees growing around were acacia trees with prickly sharp thorns. 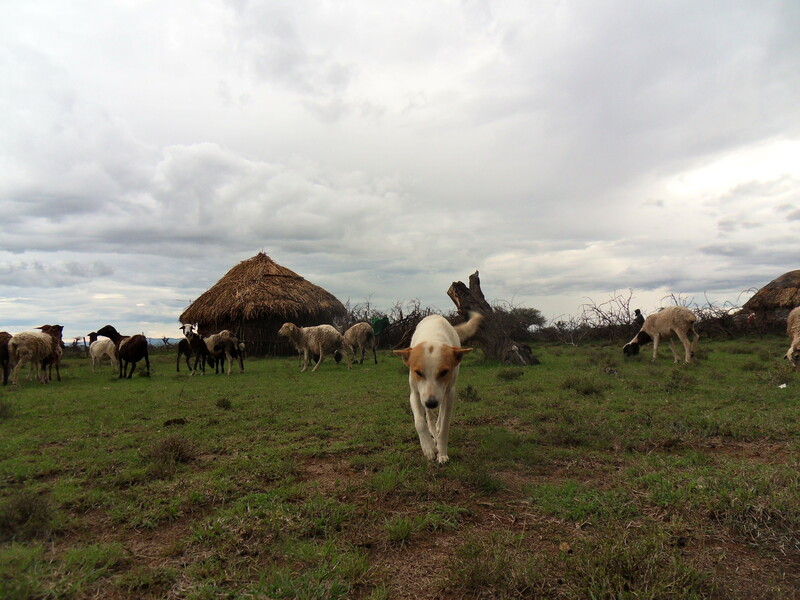 Most of the herds are looked after by Samburu girls who carry machetes with them, not for protection but to cut branches off of trees to bring back home for the fire. There is no danger during the day, lions don’t come to those parts of Kenya and hyenas are sleeping when the sun is up. When we visited James’s grandmother, one of her goats was sleeping in her hut. She told us that some time ago it was usual that goats slept with them in their huts but nowadays they build round acacia fence in the middle of each village where goats and sheep stay at night. 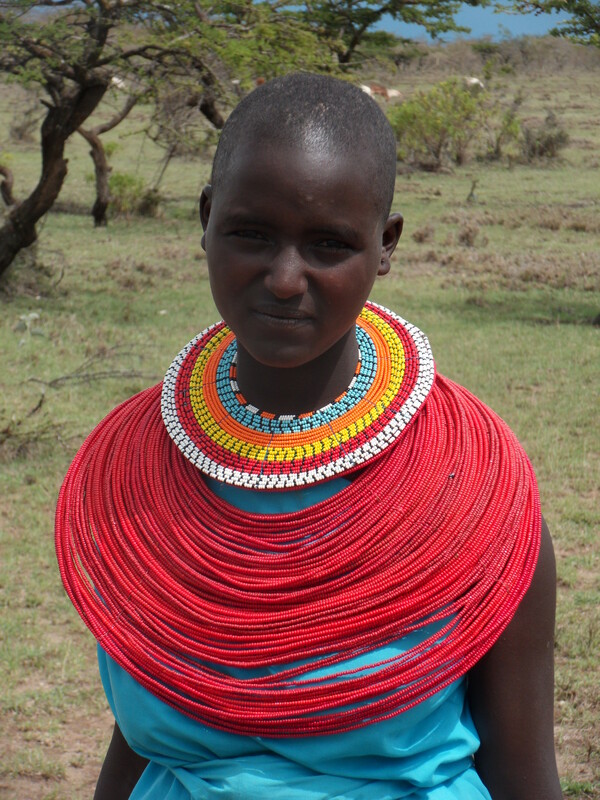 Samburu people like to wear colourful clothes and loads of jewellery. Massive round colourful necklaces, numerous bangles and colourful cloths embellish their bodies. Purple and blue coloured cloths are typical for women. Men wear only one cloth wrapped around their waist. Some of the more fashionable ones wear white cloths with a floral pattern. Until they reach adulthood, boys are plaiting their hair into thin long braids and colour them in red. 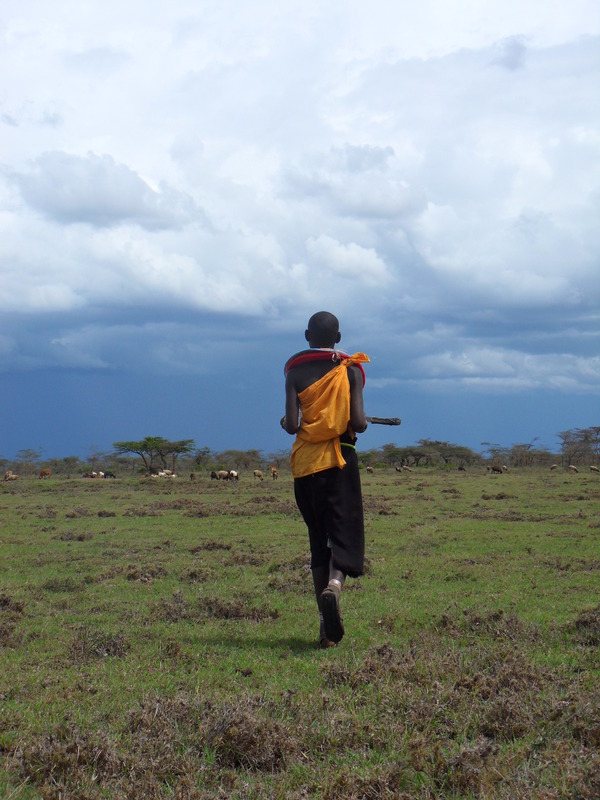 Most of the Samburu people are shepherds but many move in to bigger towns to look for jobs, usually as security guards. They are known to be reliable and honest. They also make jewellery and sell them in markets. After a long walk around the village, we got back to cook lunch and in the afternoon we went to the local river. The river is now swollen in the rainy season. I have noticed that James’s cousin is carrying soap and a piece of cloth to take a bath. I have realised how dusty and sweaty i am myself and have decided to jump in as well. No one paid attention to how the river was muddied and we all jumped in. We all shared one soap , washed ourselves properly, laughed and played in the water. No one was swimming so we stayed alongshore. I wasn’t brave enough to try to swim as the current was very strong. Samburu men are as tall as i am, but weigh at least twenty kilograms less. They are naturally slim, but they don’t lack food. They eat well a few times a day. Most of the time it’s ugali and cooked green vegetables. Once a year they celebrate entering into adulthood and both men and women get circumcised. It is a time of year to slaughter some of their cows and goats. It is also common to find camel meat. 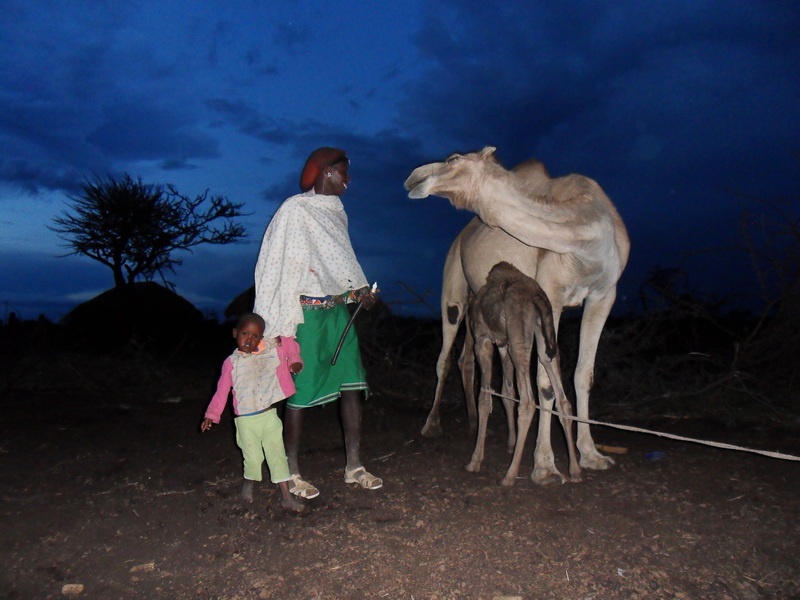 Milk from cows, goats and camels is every day diet. 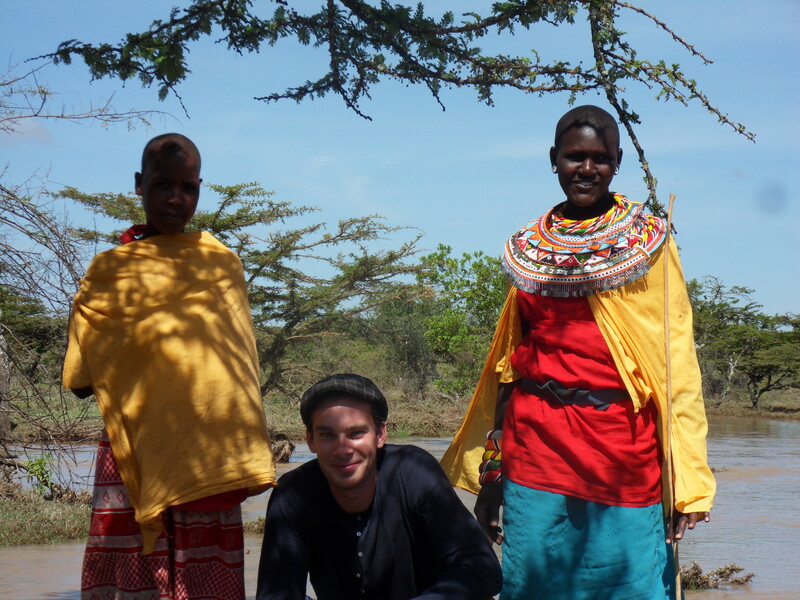 They make tea throughout the day and they call it Chai in both Samburu and Swahili. Boy is called Yero, girl Dito. After bathing in the river, we went to a nearby forest made of thorny acacia trees. We found gazelles and zebras grazing together with local goats. Hares were jumping all around. 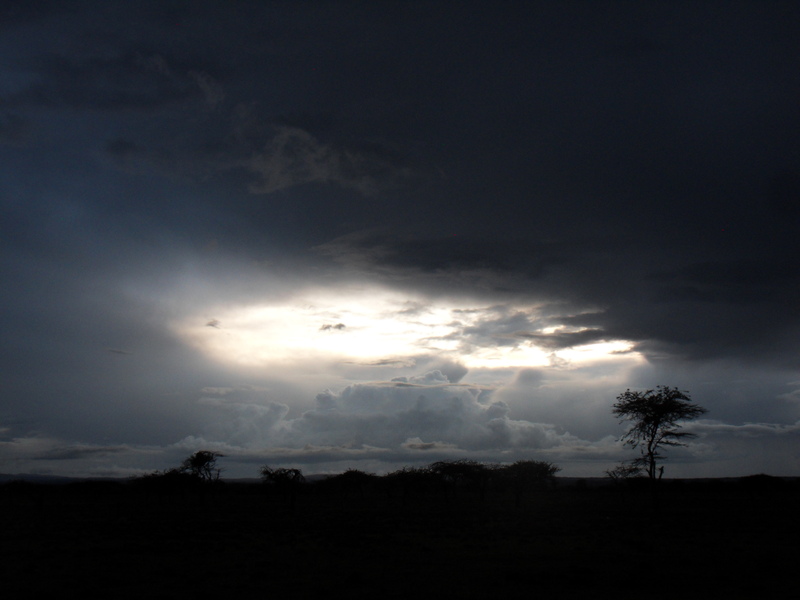 Clouds were gathering and forming a big massive dark grey almost black mass around us, so we quickly turned and headed back to the village. The dark evening brought around six boys to our manyatta and they were all sharing Samburu music on their phones through Bluetooth. Almost everybody in Kenya owns a mobile phone. You can find a good network even in the smallest village. We slept very early, our long walks made us tired. I wanted to have a good sleep as i was waking up early for the long journey back to Nairobi. To our shock, we had tiny visitors at night running all over our bodies, under our clothes and blankets. Fleas! There was no way we could fall asleep again that night. After a long and exhausting night, the morning sun rised and we jumped out of our hut and i said my good byes and got going back to Nairobi.